Preparing kids for a safe and healthy camp experience. For most kids, swimming and s’mores are all they need to have a merry time at summer camp. However, a tyke’s time away from home takes much planning on the part of the parent. Here are ways to ensure that your child’s camp adventure is new and exciting. When choosing a camp, consider your child’s whole experience. For example, if your child hates swimming, do not choose a beach camp. If your child enjoys sports, consider sending him to an athletic camp. Separately, if your child has a health condition, such as diabetes or asthma, you may consider a day camp that frequently hosts children with these conditions. Spending the day with children who have similar health issues may also help your child feel at ease with peers. At specialized camps, daily routines of medicines and treatments are commonplace and not a source of differentiation or embarrassment. Once you’ve chosen a camp, check its medical prerequisites in advance. Many require a physical exam before enrollment. This doctor’s visit is a great time to ensure your child is up to date with vaccines, prescriptions, dietary restrictions and allergies. Most outdoor camp activities are between peak sun hours of 10am and 4pm. It is likely that the counselors will remind campers to reapply sunscreen several times a day. 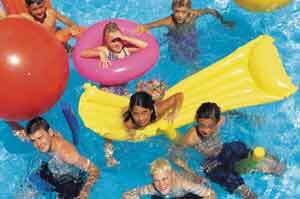 To be safe, check with your the camp’s sun safety protocol and ask if kids need a doctor’s note to apply sunscreen. No matter what the camp’s sun safety program is, you can protect your child by packing an easy-to-apply sunblock your child is willing to wear on his own. A sun protection factor (SPF) of 30 works best. As a general rule, use about a palm full per application. Sprays are also easy for kids to use and cover a large area in a short amount of time. Further, leave your child with sunglasses that filter out UVA/UVB rays, a wide-brimmed hat, lightweight clothing and SPF-rated swimwear. Before summer begins, discuss any food allergies your child has with the camp director and ask how the camp accommodates special diets. Learn how the faculty avoids cross-contamination of allergy-provoking foods and what the action plans are if a camper has an allergic reaction. If your little one does have an allergy, make sure he brings the necessary medications to camp. In the event of accidental ingestion, he’ll want it readily available. Most day camps control food consumption fairly well and may provide snacks daily. Eating healthily, however, is not easy. If possible, review the day camp’s food inventory before the session begins. Also, feel free to send your child with your own nutritious fare, such as dried fruits, nuts and easy-to-eat raw vegetables. In the weeks leading up to your child’s first day at camp, discuss the enjoyable activities and new friendships he’ll make. These conversations help your little camper prepare mentally for camp and make him feel more confident. Some level of homesickness is natural and healthy. It helps foster independence, one of the core benefits of attending day camp. As your child learns to deal with these emotions, he will become more mature and confident. As you prep your child to stay safe and healthy throughout the summer, remember that camp is a chance for you both to grow.